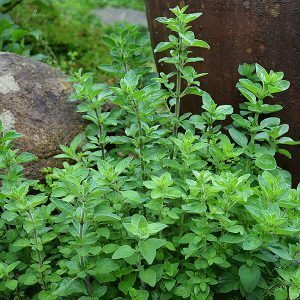 Easy to grow Oregano plants are a useful herb and they also make a great ground cover. Aromatic foliage, flowers that attract bees and they are also a great way to suppress weeds. Oregano plants are available for sale as seedlings from mail order nurseries. They can also be grown from cuttings or by division of established clumps. Origanum vulgare is readily available and is a hardy drought tolerant plant. All varieties are fairly easy to grow in any well drained humus rich soil. Lots of sun, it will grow from 40 – 90 cm, cut back regularly. Also known as Pot Majoram, this is a herb that is used extensively in Greek and Italian dishes. Oregano is fairly easy to grow in any well drained humus rich soil. Lots of sun, it will grow from 40 – 90 cm, cut back regularly. Pruning is easy and will help increase production, simply use sharp Secateurs for a fairly hard prune in spring as the weather warms up. When you look below the top part of the plant you will see new shoots and you can prune back to these. Pruning also prevents the plant from becoming woody. Oregano is best harvested before it flowers, at this stage the leaves are at their most flavoursome, full of the essential oils that add the taste. Although Oregano is grown for its oil and health benefits it is in the kitchen that most of us are familiar with this as a culinary herb. It grows well in containers and suits smaller spaces, it is used extensively in Greek and Italian dishes. Widely used in stews, pizzas and meat dishes this is a versatile herb that grows well in containers as well as in the garden. This is a plant that tastes great and the foliage is fragrant when brushed. Oregano is said to be an anti oxidant and high in vitamin K and Omega 3. Medicinal, Teas and Kitchen Herbs. Edible plants, scented and ornamentals. Wide range of perennial edibles and medicinals, berries, fruit and unusual food plants, by mail order.